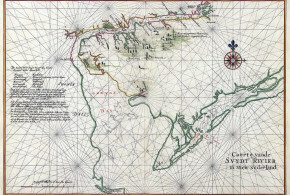 The Russian explorers reached the Pacific through Siberia in 1639. The Tsar sent later two expeditions in 1728 and 1741 under the command of Vitus Bering and Alexei Chorikov. They discovered the Aleutian Islands and Alaska. 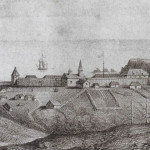 A profitable fur trade was established, Russian temporary settlements in the Aleutians and on Unalaska Island began in the 1770s and the first permanent outpost was built in 1784 at Three Saints Bay on Kodiak Island by Gregorii Shelikhov. From there the mainland was explored and other fur-trade centers were established. In 1786 Shelekhov set out for Russia, unsuccessfully seeking a grant to his company of monopoly of the fur trade. Shelekhov’s company was the nucleus for the Russian-American Company, which was formed several years after his death. By the early 1800s the Russians were exporting an average of 62000 fur pelts from North America. 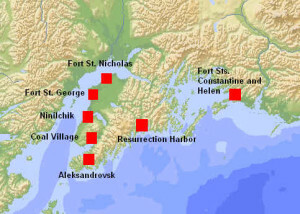 The first Russian Orthodox missionaries came to Alaska in 1794. 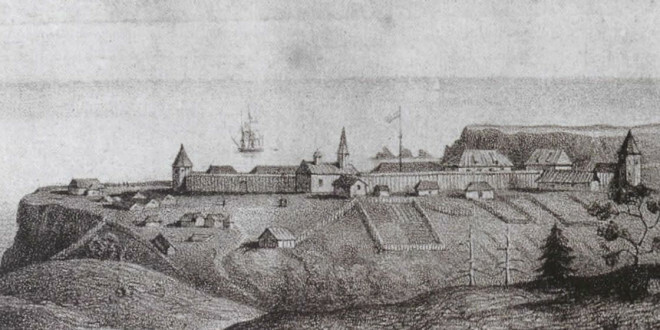 In 1791 Alexander Baranov was appointed to manage the Alaskan trading operations. Shelikhov hired him to direct the activities in North America. 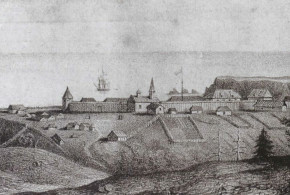 One of Baranov’s first acts was to move Shelikhov’s settlement on Kodiak island to St. Paul harbor, the present location of Kodiak City. In 1799 the new Russian-American Company nominated him as the first chief manager and the tsar appointed him as the first governor of Russian America. Baranov served the company from 1799 until 1818. In 1799 Tsar Paul I chartered the Russian-American Company. The Company was authorized to use, explore and colonize the costal areas of North America as far southward as 55° north latitude. In 1799 the Company founded a permanent base called New Archangel on Sitka island. This base was the main headquarters of the Company in America. New Archangel was destroyed in 1802. 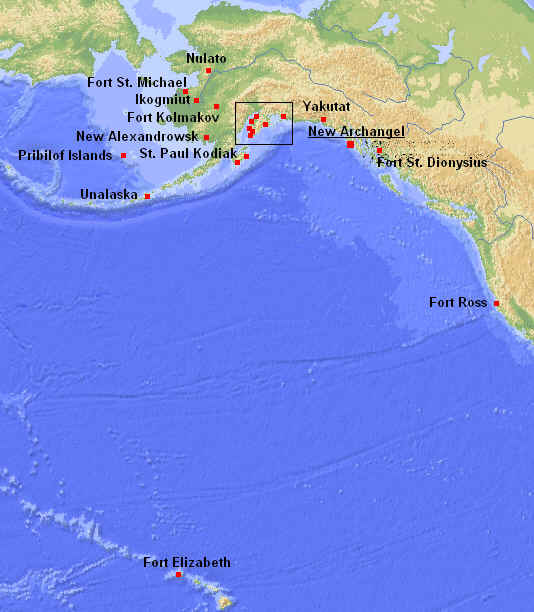 Tlingits Indians attacked the Russian fort and massacred most of the Russians and Aleutian workers there. 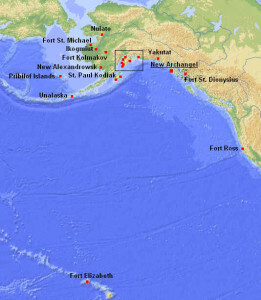 The Tlingits killed 20 Russians and up to 130 Aleutians. Baranov rebuilt the settlement in 1804. Fort Ross was established in 1812 by the Russian-American Company as an outpost for sea otter hunters and a permanent trade base. Later, as part of the Russian settlements on the coast, an outpost was established on the Bodega Bay. The company controlled all Russian trade and settlements in North America. 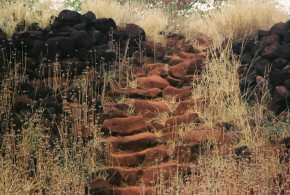 It had outposts in Alaska, on the Aleutian and Kurile Islands and also a temporary settlement in the Hawaiian Islands. 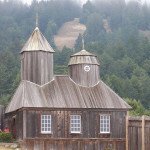 Fort Ross (named after Rossiya) was the southernmost outpost of the Russian presence in North America. 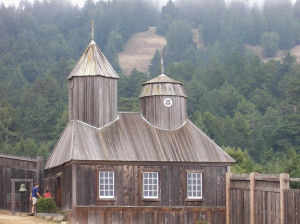 The Russians remained at Fort Ross until the year 1841. Today none of the original fort structures remain, however several buildings have been reconstructed: the first Russian Orthodox chapel south of Alaska, the stockade, and three other buildings, including the Commander’s House, which contains exhibits of the Russian-American Fur Company and the Russian occupation. The Russian presence in Alaska lasted more years. 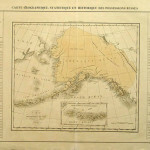 Around the 1840s a Russian Orthodox Diocese was established for Alaska. The Russian liturgy was given in Alaskan Native languages. The Russians began establishing missionary schools and churches. 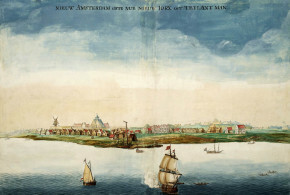 In 1861 the capital of the colony had 2500 inhabitants. The Russian Orthodox Church in Alaska had 12000 parishioners, 43 communities, 35 chapels and 9 churches. U.S. Secretary of State William Seward negotiated the purchase of Alaska for $7.2 million. The treaty was signed on 30 March 1867. The transfer occurred on 18 October 1867. – Various Authors “Outpost of an Empire. Fort Ross: the Russian colony in California” 1993, California, USA. – Various Authors “A walking tour of the compound at Fortresses Ross” 1992, Fort Ross State Historic Park, California, USA. – Black, Lydia T. “Russians in Alaska, 1732-1867” 2004, University of Alaska, Fairbanks. – Chevigny Hector “Russian America. The Alaskan venture, 1741-1867” 1998, Portland, Oregon, USA. – Essing, Ogden, DuFour “Fort Ross. California outpost of Russian Alaska, 1812-1841” 1991, Fairbanks, Alaska, USA.